Fabry disease, an inherited deficiency of the lysosomal enzyme α-galactosidase A, causes progressive intralysosomal accumulation of globotriaosylceramide (GL-3) and premature death from renal, cardiac, and cerebrovascular manifestations. To determine the long-term safety and efficacy of recombinant human α-galactosidase A, an open-label, phase III extension study was conducted, involving 58 patients who had classic Fabry disease and completed a 20-wk, double-blind, randomized, placebo-controlled, phase III study of agalsidase β and were transitioned to an extension trial to receive biweekly 1 mg/kg agalsidase β for up to an additional 54 mo. GL-3 accumulation was evaluated in the capillary endothelia of the skin, kidney, and heart. Renal function was assessed. By month 54, all patients with optional kidney biopsies (n = 8) maintained complete GL-3 clearance in renal capillary endothelial cells and multiple cell types. Continued, complete clearance of skin (31 of 36) and heart (six of eight) capillary endothelium was demonstrated. Mean plasma GL-3 levels remained decreased in the normal range. Median serum creatinine and estimated GFR remained stable (normal) in patients with renal data at month 54 (n = 41). Six patients had renal disease progression; most (four of six) were older than 40 yr and had significant proteinuria at baseline and evidence of sclerotic glomeruli pretreatment. Adverse events were generally mild and unrelated to treatment. The most common treatment-related adverse events were infusion-associated reactions, which decreased over time. Long-term agalsidase β therapy stabilizes renal function in patients without renal involvement at baseline, maintains reduction of plasma GL-3, and sustains GL-3 clearance in capillary endothelial cells and multiple renal cell types. Fabry disease is an X-linked lysosomal storage disorder that is caused by mutations in the gene that encodes the lysosomal enzyme α-galactosidase A (α-GalA), leading to deficient activity of this enzyme. The disease is characterized by a progressive pathologic accumulation of globotriaosylceramide (GL-3) and related glycosphingolipids in the plasma and various cell types (1–3). Male individuals are primarily affected, but female heterozygotes may display moderate or severe disease, which is likely related to the pattern of X-chromosome inactivation (3–5). There is a wide spectrum of Fabry disease severity, and clinical manifestations become more severe as glycosphingolipid deposition increases over time. Patients develop progressive renal disease, cardiac disease, and cerebrovascular disease (3), which lead to high morbidity and premature mortality (1). Until the development of enzyme replacement therapy (ERT), Fabry disease was treated primarily with supportive measures (6). In an open-label phase I/II trial, treatment with agalsidase β rapidly and markedly cleared GL-3 deposits from the major sites of classical Fabry pathology, namely the vascular endothelium of the kidney, liver, heart, and skin (7). A randomized, placebo-controlled pivotal phase III trial subsequently confirmed the safety and the efficacy of 1.0 mg/kg agalsidase β administered every 2 wk for a total of 20 wk (8). By study end, GL-3 clearance from the capillary endothelial cells of the kidney, heart, and skin was significantly greater in patients who received agalsidase β versus placebo (P < 0.001), and plasma GL-3 (determined by ELISA) was reduced to undetectable levels in patients who were treated with agalsidase β (8). Short-term clinical trials have relied on surrogate markers to indicate efficacy because later-stage complications develop gradually over an extended period of time. However, the long-term goal of ERT is to prevent, stabilize, or slow progression of Fabry pathology. 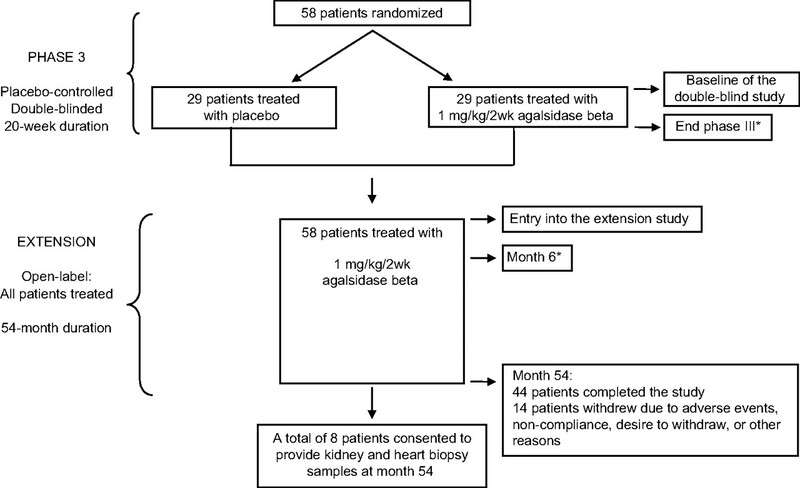 To investigate the long-term safety and efficacy of agalsidase β therapy, all 58 patients from the double-blind, 20-wk study entered an open-label extension trial in which they received biweekly 1.0 mg/kg agalsidase β infusions for up to an additional 54 mo. This represents the longest study of patients who had Fabry disease and received a therapy targeted specifically to their disease. Interim evaluation after 30 mo demonstrated that agalsidase β treatment was associated with sustained capillary endothelial GL-3 clearance in skin biopsies, sustained reduction to normal levels of plasma GL-3, and stable serum creatinine and estimated GFR (eGFR) (9). Here, we report the final safety and efficacy findings of this open-label extension study after 54 mo of therapy. All patients who had Fabry disease and completed the double-blind trial and provided written informed consent were eligible for enrollment in the extension study. Patient inclusion/exclusion criteria have been described (8). The study was conducted in accordance with the Declaration of Helsinki and was approved by the institutional review board and/or independent ethics committee of each participating center. This was an open-label extension trial with no placebo treatment (registration NCT00074971, clinicaltrials.gov) (Figure 1). Patients had previously participated in a placebo-controlled, double-blind trial of agalsidase β (1 mg/kg every 2 wk) or placebo for 20 wk. All patients in the extension study received 1 mg/kg (0.9 to 1.1 mg/kg) agalsidase β every 2 wk for up to an additional 54 mo, with the exception of one patient, whose dose was increased to 3 mg/kg because of worsening renal function. Before infusion, all patients received acetaminophen 975 to 1000 mg. A few patients received pretreatment with an antihistamine and/or ibuprofen to minimize infusion-associated reactions (IAR). Beginning infusion rates (≤0.25 mg/min [15 mg/h]) were increased as tolerated to a minimum infusion time of 90 min. Design of phase III and extension study. All 58 patients from the double-blind phase III trial entered the extension study (registration NCT00074971, clinicaltrials.gov). Kidney and cardiac biopsies that were required by study protocol are indicated by the asterisks at baseline of the phase III study, end of the phase III study, and month 6 of the extension study. Optional kidney and heart biopsies were obtained from eight patients at month 54. Clinical evaluations were performed at study entry and every 6 mo after entry into the extension study (9). Health status was evaluated with the Short Form-36 (SF-36) Health Status Survey (10) in which scores ranged from 0 to 100 (best possible score). Pain was evaluated with the Short Form McGill Pain Questionnaire (11), in which scores ranged from 0 (no pain) to 45 (severe pain) and included a visual analog scale and a present pain intensity scale. Patients were questioned about use of pain medication from month 24. All adverse events (AE) were assessed throughout for severity and relationship to study drug. Biochemical evaluations that consisted of mass spectrometric quantification of GL-3 in the plasma have been described (9). Renal function was assessed by serum creatinine testing and eGFR (9) calculated by the Modification of Diet in Renal Disease Study equation (12). Proteinuria was defined as the ratio of urine protein to urine creatinine. Serum samples for recombinant human α-GalA (rh-αGalA) IgG antibody testing were initially collected every 2 wk before study drug infusion. After month 24, serum samples were collected at every other visit, and after month 36, serum samples were collected every 6 mo. Detailed analytical methods have been published (9). Concomitant medications that were taken during the study, including pain medications and angiotensin-converting enzyme inhibitors (ACEI)/angiotensin II receptor blockers (ARB), were recorded using the World Health Organization Drug Dictionary (13). Histologic evaluations of kidney, heart, and skin tissues were performed during the extension study by a total of nine independent pathologists (three each for renal, cardiac, and skin evaluations) who were blinded to initial treatment group. Skin biopsies were collected at 6, 12, 18 (optional), 30, 42, and 54 mo. Histologic evaluations of the capillary endothelium of the skin were conducted using light microscopy (LM) to determine accumulation of GL-3. Histologic evaluation of the capillary endothelium of the heart and kidney for GL-3 accumulation was conducted at month 6 (or month 12, if the month 6 biopsy was postponed) and optionally at month 54, if deemed medically appropriate, using LM. Other cell types from the kidney (14,15) were also evaluated using LM. The degree of GL-3 deposition was rated using an ordinal scale as reported previously (8,14). GL-3 accumulation in podocytes and distal convoluted tubule/collecting ducts was assessed at month 6 and scored relative to baseline values; at month 54, the ordinal scoring system was used. The number of glomeruli, the number of globally sclerotic glomeruli, and the number of glomeruli with FSGS were recorded. The percentage of sclerotic glomeruli was calculated as follows: Number of globally sclerotic glomeruli + number of glomeruli with FSGS divided by the number of evaluable glomeruli. Data during the extension study were combined with the original double-blind study to show how scores changed from baseline to month 54/final study visit. Baseline refers to entry into the double-blind study. Comparisons were made to pretreatment values which were (1) at entry into the double-blind study for patients who received agalsidase β during the double-blind study and extension study and (2) at entry into the extension study for patients who were originally in the placebo group of the double-blind study. All statistical comparisons were carried out as two-tailed tests. The “as treated” patients included all patients according to the treatment they actually received for the majority of their infusions in the double-blind trial and had at least one infusion in the extension study. Efficacy and safety end-point analyses were conducted on the “as treated” population. One-sample t tests were conducted to test for significant differences from zero in mean changes in mean GL-3 scores, eGFR, serum creatinine, Short Form McGill Pain Questionnaire scores, SF-36 scores, and proteinuria within each treatment group. Medians and quartiles for eGFR at each data collection time point were calculated for subgroups of patients. Patients were subgrouped on the basis of baseline proteinuria (≤1 and >1 g/24 h) as well as by percentage of sclerotic glomeruli at pretreatment (≥50 and <50%). GFR slopes over time on the basis of these two subgroups of patients were estimated by mixed-effect models using random effects to determine an intercept and GFR slope over time for each patient. Logistic regression was used to determine the probability of a renal event (defined as having a >50% increase in serum creatinine over the pretreatment assessment and the increased value >1.4 mg/dl) on the basis of baseline proteinuria and percentage of pretreatment sclerotic glomeruli. All 58 patients who participated in the phase III study entered the 54-mo, open-label phase III extension study. Demographic characteristics for all patients at entry into this extension study are shown in Table 1. A total of 14 patients discontinued or withdrew from the study prematurely as a result of serious AE (SAE; two of 58), noncompliance (four of 58), voluntary withdrawal (four of 58), or positive IgE antibody or skin testing criteria (four of 58). The two patients who discontinued because of SAE included a 43-yr old man who had a history of cardiovascular disease and died of sudden cardiac arrest after 13.3 mo of treatment with agalsidase β. An autopsy revealed severe heart disease consistent with Fabry disease. A 46-yr-old man who received agalsidase β for 60 mo experienced a urinary tract infection and sepsis that led to death. Of the four patients who were withdrawn per protocol as a result of IgE antibody development or skin testing criteria, three had positive skin tests but negative IgE sera tests. All four patients were able to continue agalsidase β therapy either in a separate rechallenge protocol or in the commercial setting. The mean duration of treatment for all patients was 52.2 mo. Despite the long-term nature of this study, relatively few infusions were missed by patients who completed the study (n = 44). The majority (84%) of patients received at least 90% of their possible infusions. Four patients missed ≥20% infusions. All patients were included in the safety and efficacy analyses. At the beginning of the study, initial infusions ranged from 4 to 6 h to preserve the study blind. However, by month 54, the mean infusion time for all patients who received full infusions was 2.5 h ± 36.5 min. The majority (72%) received most of their infusions in ≤2.5 h, and 48% of patients received the majority of their infusions in ≤2.0 h.
Eleven patients received home infusion, which were generally well tolerated. For reasons unrelated to agalsidase β treatment, one patient needed to return to study site infusions after eight successful home infusions. Two patients had mild IAR after beginning home infusion (one experienced vomiting, the other experienced rigors). Among the 23 patients who received ACEI/ARB therapy during the study, mean (SD) baseline proteinuria was 0.82 (0.97) g/24 h and remained unchanged at the end of the study. Mean (SD) pretreatment and end-of-study systolic BP (SBP)/diastolic BP (DBP) values among these patients were 129 (14)/72 (10) and 124 (14)/72 (11), respectively. Pretreatment histologic evaluations of renal, cardiac, and skin biopsies revealed substantial deposits of GL-3 in microvascular endothelial cells (8). Kidney biopsies were obtained from 49 patients 6 mo after entry into the extension study (month 6) and from eight patients at month 54 of the extension study. At month 6, nearly all (47 of 49) patients achieved a score of 0, indicating GL-3 clearance from the renal interstitial capillary endothelial cells (8). 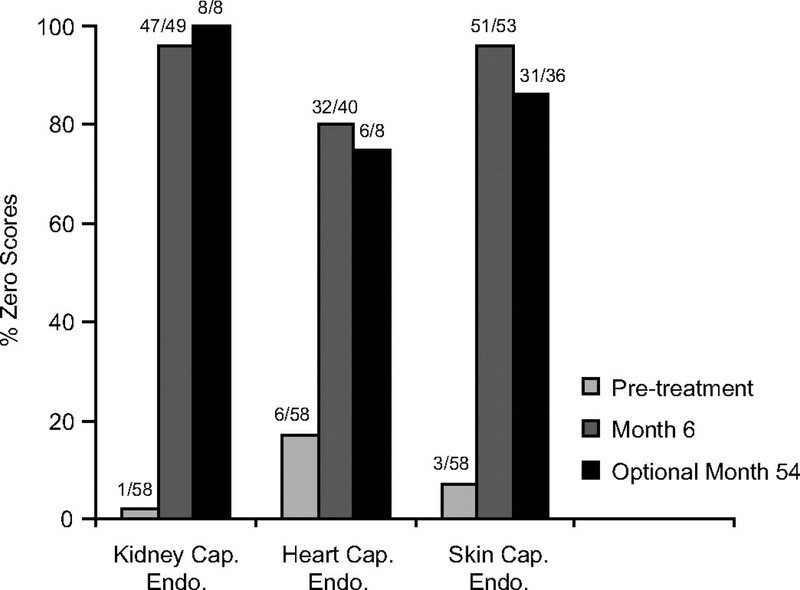 By month 54, all (eight of eight) patients had capillary endothelial cell scores of 0 (Figure 2). Globotriaosylceramide (GL-3) clearance from kidney, heart, and skin capillary endothelium in all patients. Histologic specimens that were obtained at pretreatment, month 6, and month 54 (optional for kidney and heart) were evaluated for the presence of GL-3. Results show that for the majority of patients, initial GL-3 clearance (score of 0) seen at month 6 was maintained during the 54-mo treatment period. Numbers above bar graphs represent the number of patients with zero scores out of the total number evaluated. cap. endo., capillary endothelium. Several other renal cell types were examined (Figures 3 and 4, Table 2). 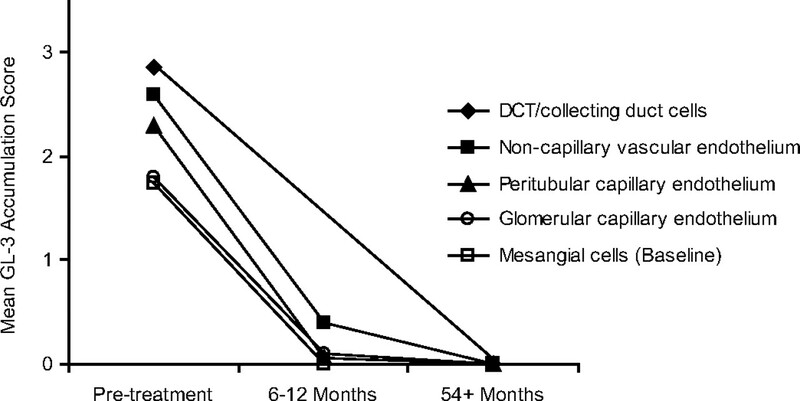 At month 54, all assessable patients continued to achieve clearance of GL-3 from glomerular endothelial cells (n = 5), mesangial cells (n = 5), and noncapillary endothelial cells (n = 6) of the kidney (Figure 3, Table 2). In addition, all patients (n = 7) had a score of 0 for distal convoluted tubule/collecting duct cells at month 54. Interstitial cells were cleared of GL-3 accumulation in the majority (five of seven) of patients by month 54 (Table 2). However, complete GL-3 clearance was not observed in noncapillary smooth muscle (n = 6; Table 2). Agalsidase β therapy reduced GL-3 accumulation to zero at 54 mo in various types of kidney cells. For distal convoluted tubule (DCT)/collecting duct cells, baseline scores were obtained at the beginning of the double-blind trial and at month 54 on a 0 to 3 scale. For all other cell types, pretreatment scores were obtained before agalsidase β treatment as defined in Materials and Methods. Mesangial cells were scored on a scale of 0 to 2, and other cell types were scored on a scale of 0 to 3. Long-term agalsidase β therapy decreases GL-3 accumulation in podocytes. (A) Kidney biopsy that was obtained before agalsidase β therapy exhibits dark-staining granules in podocytes. (B) By month 54, fewer GL-3 inclusions are evident from a specimen that was obtained from the same patient. Methylene blue/azure II stain (13). Magnification, ×400. Podocytes, which are terminally differentiated cells, are heavily laden with GL-3 as a result of slow turnover rates. Nevertheless, continued improvement in podocyte clearance was seen at month 54 (Figure 4). By month 54, 67% (four of six) of patients demonstrated a one-point reduction in podocyte GL-3 inclusions from baseline. Of note, although podocytes were not completely cleared of GL-3 deposits, serum creatinine levels remained stable in all but one patient. The majority (32 of 40) of evaluable patients had nearly complete clearance of GL-3 from the cardiac capillary endothelium (i.e., score = 0) at month 6 (Figure 2). Similar results were achieved for the limited number of patients with optional biopsies at month 54, when six of eight patients achieved a score of 0. The remaining two patients had scores of 1 (mild) at month 54; neither patient experienced a cardiac SAE during the study. Skin biopsies were assessed for continued GL-3 clearance from 36 patients at month 54, and 31 (86%) patients demonstrated complete clearance of GL-3 (Figure 2). The five patients with nonzero scores at month 54 had a score of 1 compared with higher pretreatment scores of 2 (n = 3) and 3 (n = 2). These patients had normal plasma GL-3 levels at month 54 and showed a downward trend in IgG antibody titers. None of the patients had renal disease progression; one patient with kidney biopsy at month 54 demonstrated complete GL-3 clearance of renal capillary endothelial cells. Mean plasma GL-3 levels showed a decrease to normal levels (≤7.03 μg/ml) within 6 mo of treatment with agalsidase β (9), and mean plasma GL-3 levels remained normal through month 54 in both groups (data not shown). Median serum creatinine remained stable and normal throughout the 54-mo treatment period; however, a rise in mean serum creatinine was observed between months 36 and 54, which can be attributed to the renal disease progression of six patients (data not shown). The eGFR slopes for each patient with renal progression were −3.5, −4.7, −6.0, −8.2, −9.9, and −12.1 ml/min per 1.73 m2/yr. The mean rate of eGFR decline for the remaining patients (n = 52) as a group was −0.4 ml/min per 1.73 m2/yr and not significantly different from 0 (P = 0.6785). Patients who demonstrated renal progression during the trial shared a common clinical profile, including age >40 yr (four of six), significant baseline proteinuria (>2 g/24 h; four of six), and >50% glomerular sclerosis at pretreatment (four of four). One of these patients missed 39% of his infusions, which could have contributed further to his renal disease progression. Five of the six patients received ACEI/ARB therapy during the trial. Mean (SD) pretreatment and end-of-study SBP/DBP values among these six patients were 128 (9)/74 (7) and 131 (22)/78 (10), respectively. At entry into the extension study, median eGFR was normal and remained stable through month 54 (Figure 5). Ten patients had reduced eGFR (<90 ml/min per 1.73 m2) at baseline. Of these, six patients had either stabilization (eGFR ± 20%) or improvement in eGFR at the end of the study. Median estimated GFR (eGFR; ml/min per 1.73 m2) over time. Patients in the “as treated” population maintained a stable median eGFR during the 54-mo treatment period, which was observed in both the placebo/agalsidase β and the agalsidase β/agalsidase β treatment groups (left) as well as in the overall, combined population (right). Subgroup analyses were performed to examine the impact of baseline proteinuria or glomerulosclerosis on renal function during the study period (Figures 6 and 7). During the 54-mo treatment period, patients (n = 10) with high (>1 g/24 h) baseline proteinuria consistently had lower median eGFR values compared with those with lower (≤1 g/24 h) proteinuria at baseline. The mean rate of decline in eGFR for patients with high baseline proteinuria was −7.4 ml/min per 1.73 m2/yr (SEM 1.9), which was significantly different from 0 (P = 0.0003; Figure 6A). In contrast, patients (n = 42) with low (≤1 g/24 h) proteinuria at baseline showed a mean (SEM) eGFR slope of −1.0 ml/min per 1.73 m2/yr (1.0; P = 0.3052). Similarly, patients (n = 8) with pretreatment glomerulosclerosis ≥50% revealed a higher rate of decline in eGFR (−8.9 ml/min per 1.73 m2/yr; P = 0.0001) during the course of the study compared with patients (n = 32) with <50% glomerulosclerosis at pretreatment (−1.4 ml/min per 1.73 m2/yr; P = 0.2039; Figure 7A). The risk for renal events also increased with higher baseline proteinuria (Figure 6B) and the degree of pretreatment glomerulosclerosis (Figure 7B). High (>1 g/24 h) baseline proteinuria is associated with higher rate of eGFR decline and increased probability of renal events. (A) Subgroup analyses of patients in the “as treated” population who were stratified by baseline proteinuria (≤1 g/24 h versus >1 g/24 h) showed differences in the rate of eGFR decline during the 54-mo treatment period. (B) Increased baseline proteinuria values seem to correlate with the probability of renal event (a 50% increase in serum creatinine from the pretreatment assessment and the increased value was >1.4 mg/dl). Note that baseline proteinuria was determined before entry into the double-blind study for all patients. Pretreatment glomerulosclerosis involving ≥50% glomeruli is associated with higher rate of eGFR decline and increased risk for renal events. (A) Subgroup analyses of patients in the “as treated” population show that those with pretreatment glomerulosclerosis (≥50% sclerotic glomeruli) had a higher rate of decline in eGFR compared with patients with <50% sclerotic glomeruli at pretreatment. (B) As pretreatment glomerulosclerosis increases, the likelihood of having a renal event (a 50% increase in serum creatinine over the pretreatment assessment and an increased value >1.4 mg/dl) also increases. Median proteinuria remained stable from baseline through month 54. 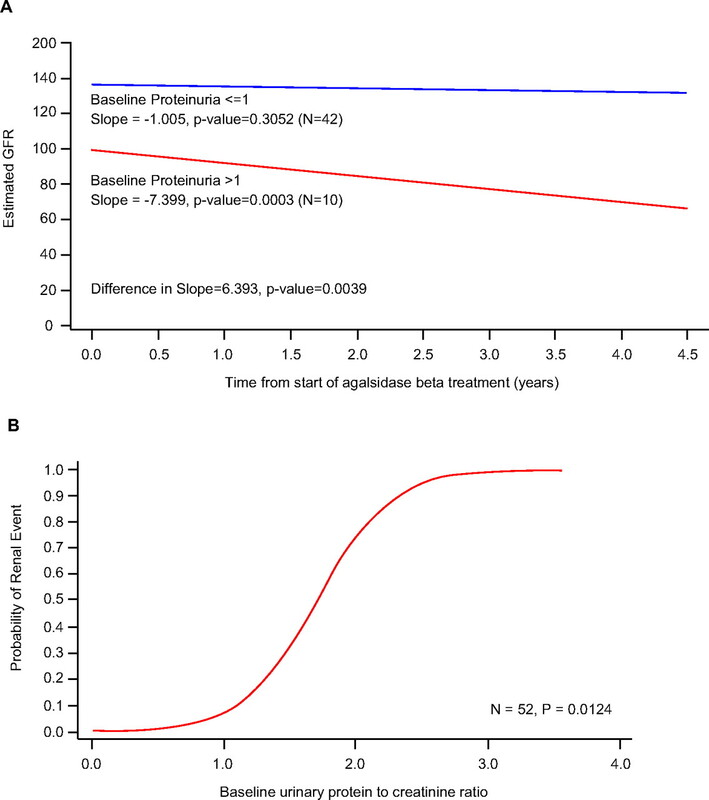 Six of the 10 patients with baseline proteinuria >1 g/24 h and four of six patients with baseline glomerulosclerosis ≥50% received some ACEI/ARB therapy during the course of the study. Some of these patients had a decrease in their proteinuria values during the course of the study, whereas others had increased or unchanged values. Proteinuria values did not change substantially during the course of treatment for the whole population. Pain scores, as measured by the McGill Pain Questionnaire, improved over time for those who reported pain at pretreatment (score >0). Among these patients, present pain intensity improved from a mean overall score of 1.56 at pretreatment to 0.93 at month 54 (P = 0.016). A statistically significant improvement in mean visual analog scale scores at month 54 was also observed for these patients (P = 0.007). For most SF-36 components, patients experienced a mean improvement after long-term treatment with agalsidase β. The mean changes from pretreatment through month 54 for the components of Physical Functioning, Role Emotional, Body Pain, and Standardized Physical Component Scale (for patients with score <100 at first measurement before treatment) were statistically significant (P = 0.015, 0.031, 0.003, and 0.006, respectively). Small improvements were observed for the other components, although none reached statistical significance. All 58 patients experienced at least one AE since the beginning of treatment with agalsidase β. Most AE were mild and unrelated to treatment. The most common related AE were IAR, consisting of rigors, temperature, changed sensation, fever, nausea, headache, vomiting, flushing, chest pain, rhinitis, pruritus, tremor, dyspnea, somnolence, and acroparesthesia (Table 3). Most IAR were assessed as mild, and the total number of patients who experienced IAR markedly decreased over time. Eight patients experienced a total of 15 related SAE, and the events in three of these patients were considered severe. In many cases, the SAE were IAR, including tachycardia, hypertension, urticaria, chest pain, fever, and rigors. In this long-term study, five (9%) of 58 patients experienced symptomatic stroke or transient ischemic attack as an AE. All five patients were male, with a mean (SD) age of 35.3 (7.8) yr (range 22.6 to 41.8 yr). One of these patients, 41 yr old at study entry, had a history significant for stroke. One patient had a history of mitral valve regurgitation, and another had a medical history of a right frontal hypodensity of the semioval center on computed tomography scan. Overall, 52 (90%) of 58 patients seroconverted. The majority of patients seroconverted within the first 3 mo of receiving agalsidase β. Of these patients, one patient was assessed a “low responder” (IgG titers not exceeding 800), 32 patients demonstrated a downward trend in titers based on a four-fold or more reduction in titer from the peak measurement to the last measurement, nine patients demonstrated a plateau in their antibody titers, and nine patients tolerized (no detectable IgG antibodies determined by ELISA and two consecutive negative confirmatory radioimmunoprecipitation assays). Of the two female patients enrolled, one patient tolerized and the other patient remained seronegative. The frequency of IAR increased in parallel with the seroconversion rate but then decreased over time (Figure 8). All eight patients with kidney biopsies at month 54 demonstrated GL-3 clearance, despite that seven of eight developed IgG antibodies against rh-αGalA. The peak antibody titers for patients who had renal progression were similar to those of patients who did not progress. Seroconversion does not appear to influence incidence of infusion-associated reactions (IAR) over time. Overall, 90% of patients seroconverted, with the majority of patients having seroconverted within 3 mo of the first agalsidase β infusion. The percentage of patients with IAR peaked early in the treatment period and coincided with IgG seroconversion. This overall seroconversion status was maintained over time; nevertheless, the percentage of patients with IAR steadily declined. This open-label extension study provides clinical trial data on a cohort (n = 58) of patients who had Fabry disease with the longest reported follow-up worldwide. Results confirm the expectation of sustained GL-3 clearance from kidney, skin, and heart capillary endothelium; multiple renal cell types; and plasma. Moreover, renal function tests indicate that early institution of long-term treatment with agalsidase β stabilizes renal disease progression in patients with Fabry disease. After 54 mo of treatment with agalsidase β, median eGFR, proteinuria, and serum creatinine remained stable and normal. Six patients had renal disease progression despite effective substrate clearance with agalsidase β, including three patients who were previously identified at 36 mo (9). These patients shared common baseline characteristics that might have predisposed them to renal progression. Most were older than 40 yr, which is associated with increased risk for renal disease progression in patients with Fabry disease (16,17). The mean pretreatment and final SBP/DBP values were not substantially different, suggesting that BP did not contribute to renal progression. Other factors that were common among these six patients with renal progression included high pretreatment glomerulosclerosis and high baseline proteinuria, which indicated extensive renal involvement despite near-normal serum creatinine at baseline. It is possible that the presence of extensive glomerulosclerosis or high proteinuria before ERT initiation could be used to predict renal outcome. Subgroup analyses involving the entire evaluable study population explored this possibility. The findings suggest that significant renal involvement at pretreatment increases the likelihood for renal progression over time and is predictive of renal events, underscoring the importance of a comprehensive assessment of renal disease before initiating ERT. Importantly, these analyses also suggest that patients who do not exhibit evidence of extensive glomerulosclerosis by renal biopsy and heavy proteinuria at baseline can achieve effective stabilization of renal function with agalsidase β. A randomized, double-blind, placebo-controlled trial of agalsidase β in patients who had Fabry disease with more advanced renal disease was recently reported (18). This study demonstrated clinical benefit by slowing the rate of renal, cardiac, and cerebrovascular events. Clinical outcome findings confirmed histologic evaluations of sustained GL-3 clearance. By month 54, kidney capillary endothelium continued to show complete clearance of GL-3 deposition. Persistent clearance of GL-3 in noncapillary vascular endothelium, glomerular capillary endothelium, and mesangial cells was also observed. Importantly, podocytes and distal convoluted tubule/collecting duct cells, which are laden with GL-3 deposits, also showed improvement or clearance of GL-3 stores, respectively, suggesting that exogenous enzyme gains access to and is effective in these sites over time. Long-term GL-3 clearance was also shown in cardiac and skin capillary endothelial cells. Mean plasma GL-3 levels rapidly reduced within months of initiation of agalsidase β therapy and remained normal throughout the 54-mo open-label period. Collectively, these results indicate that long-term therapy with agalsidase β maintains GL-3 clearance achieved with short-term treatment and that continued treatment begins to reduce existing stores of GL-3 substrate in other cell types that are challenging to treat. As we noted, median proteinuria values remained unchanged through the study. Some of the patients, particularly those with heavy proteinuria or advanced glomerulosclerosis, received ACEI/ARB therapy at the investigators’ discretion; however, the effect on proteinuria was variable. 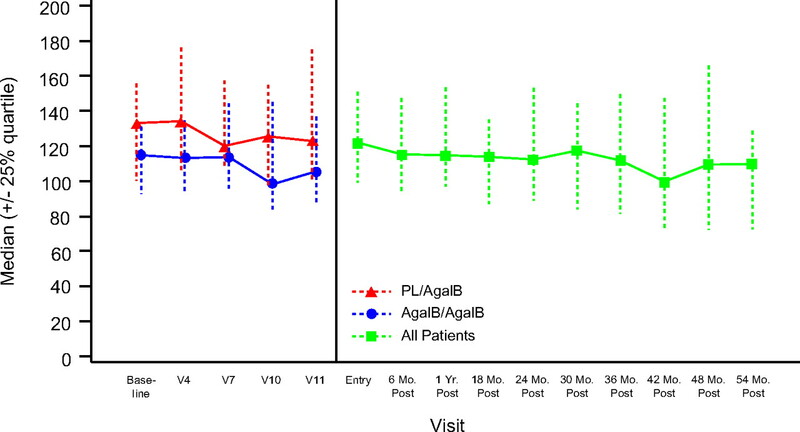 It is possible that some of these patients whose values continued to increase or remained unchanged could have had a decrease in their proteinuria values with aggressive intervention with ACEI/ARB therapy. The study was not designed to address this question, so no meaningful conclusions can be made. A limitation of this study is the lack of a parallel control group. However, relative to patients who have Fabry disease and receive only symptomatic care, patients who receive agalsidase β therapy seem less likely to have renal disease progression. For example, in a study by Branton et al. (15) that followed the clinical course of 105 male patients with Fabry disease, 39 (37%) patients developed chronic renal insufficiency (CRI). Furthermore, the rate of decline in GFR for 14 of these patients averaged −12.2 ± 8.1 ml/min per yr once CRI had developed (15). In this study, median serum creatinine and median eGFR remained stable during the 54-mo agalsidase β treatment period. It should be recognized that the patients who received agalsidase β were, on average, younger and had less advanced renal disease than those in the Branton study who developed CRI. Follow-up of the long-term effects of agalsidase β treatment in this cohort of patients will provide additional insight into the progression of renal disease. Scores on the McGill Pain Questionnaire were low at pretreatment, possibly as a result of unrestricted use of pain medications. Nevertheless, scores improved over time with agalsidase β treatment among patients who reported pain/difficulty at pretreatment, and intermittent reduction and/or cessation of pain medication use was noted for some patients. Together with data demonstrating significant improvement in several SF-36 components among patients with pretreatment scores <100, these results suggest that agalsidase β treatment had a positive effect on patient quality of life. Agalsidase β treatment was well tolerated. IAR were the most common treatment-related AE, which decreased over time. A total of five (9%) patients experienced a symptomatic stroke or a transient ischemic attack during treatment with agalsidase β. Although most patients seroconverted by month 54, IgG antibody titers were independent of response to 1 mg/kg agalsidase β therapy, as evidenced by long-term renal stabilization, continued reduction in histologic scores for cellular clearance of GL-3, and sustained normal mean plasma levels of GL-3. The majority of seroconverted patients demonstrated a four-fold or more reduction in antibody titer from peak measurement to the last measurement, and 17% (nine of 52) of patients tolerized. Testing for in vitro inhibitory activity was performed on all IgG-positive patients who participated in this study. The clinical significance of in vitro inhibitory activity and its relationship to plasma GL-3 levels in these patients who received agalsidase β treatment is unclear. On the basis of the limited available data, there does not seem to be a correlation among IgG antibody titers, plasma GL-3 levels, and the patients’ clinical status. The clinical relevance of in vitro inhibitory activity results among patients who were treated with agalsidase β remains unknown. During the course of the 54-mo study, patients were able to tolerate higher infusion rates and achieve shorter infusion times. In fact, many patients were successfully and conveniently infused in the home. By study end, the mean infusion time for all patients who received full infusions was reduced from the initial rate of 4 to 6 h down to approximately 2.5 h.
The final results of this 54-mo, phase III, open-label extension trial demonstrate long-term agalsidase β efficacy in GL-3 clearance from kidney, heart, skin, and plasma. Early and continued intervention with agalsidase β preserves renal function, as measured by serum creatinine and eGFR, and seems to retard renal disease progression. Further investigations should include determining the long-term efficacy of agalsidase β therapy on cardiac and cerebrovascular manifestations. This research was supported by Genzyme Corp. (Cambridge, MA). In addition to the authors, the following members of the Fabry Study Group participated in the study: M. Leary (Boston, MA), G. Cohen (Baltimore, MD), P. Cochat (Lyon, France), M. Azizi, K. Benistan (Paris, France), P. Mathew (Albuquerque, NM), S. Packman (San Francisco, CA), C.R. Scott (Seattle, WA), R.E. Hart (Hickory, NC), D. Jackson (Billings, MT), R. Lyons (San Antonio, TX), N. Weinreb (Coral Springs, FL), F.M. Joglar (San Juan, PR), C. Hollak (Amsterdam, Netherlands), A. Macklin (Dorset, UK), G. Mourad (Montpellier, France), B. Dussol (Marseille, France), P. Le Pogamp (Rennes, France), C. Combe (Bordeaux, France), G. Piszker (Paray-Le-Monial, France), A. Goldstein (Le Mans, France), N. Brion (Aubervilliers, France), B. Richalet (Saint-Lô, France), F. Stewart (Belfast, Ireland, UK), O. Chabre, P.S. Jouk (Grenoble, France), and B. Bénichou, T. Brengola, M.M. Kaper, D. Mackey, S. Richards, B. Thurberg, and S. Walbillic (Genzyme Corp., Cambridge, MA). We thank the patients and study personnel who participated in the study. We also thank Dianne Barry, PhD, for writing assistance. D.P.G. and S.W. contributed equally to this work. M.B. 's current affiliation is Department of Neurology and Pediatrics, New York University, New York, New York. See the related editorial, “Enzyme Replacement Therapy and Fabry Kidney Disease: Quo Vadis?” on pages 1368–1370. Enzyme Replacement Therapy and Fabry Kidney Disease: Quo Vadis?